Around 2003 I began the political foot work to establish Ediffah, a project aiming at establishing an union catalog for archival collections at the larger Swedish research libraries. As usual when you're up to something like that you have to talk to and visit the right people. 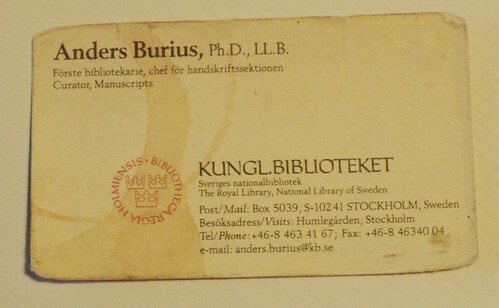 One of the right people, in this case, was the Head of Manuscript and Rare books collections at the National Library of Sweden (KB). Let's call him John, since that is what he is called in the TV series that came up recently on Swedish National Television. I met John in his office at KB. He had a light grey tailored suit, a white shirt and a thick tie with broad stripes in white and dark and light blue. His suit jacket hang on his chair. What I remember most was the very whiteness of his shirt, and how he mixed intellectual brilliance with arrogance. Intellectuals are common in the library communities, but John was an odd fowl with his shirt and his arrogance. We met two more times, both times were project meetings within Ediffah. A handful archivists and manuscript curators from the National Archives and the largest research libraries. John and one other member of the group had both earned their doctorates at a the same department of Uppsala University. The two former colleagues apparently hated each other, but John was the only one of the two who showed it. One morning in December 2004, the unravelling of large scale book theft was the leading news items on radio and our daily paper. The value of the stolen material amounted to tens of millions SEK. By lunch the identity of the thief had reached all research libraries in the nation. A friend of mine, Birgitta Lindholm, curator of manuscripts at Lund university library, told me her story of that morning. All libraries with something like a manuscript collection participate in a collaboration and their responsible curators meet regularly. They should have a meeting this day. She picked up a paper at the airport and started to read about the theft. And how one of the leaders at the library had been arrested. All curators appeared at the meeting. Except John. They took for granted that he was needed in his office that morning. After his confession and after the police had all what it has to do in a case like this, John was released while waiting for his trial. Three days later he ended his life in a most dramatic way. I once smoked a cigarr with John. This entry (I have smoked a cigarr together with The Book Thief) within Sigfrid Lundberg's Stuff, by Sigfrid Lundberg is licensed under a Creative Commons Attribution-ShareAlike 3.0 Unported License.